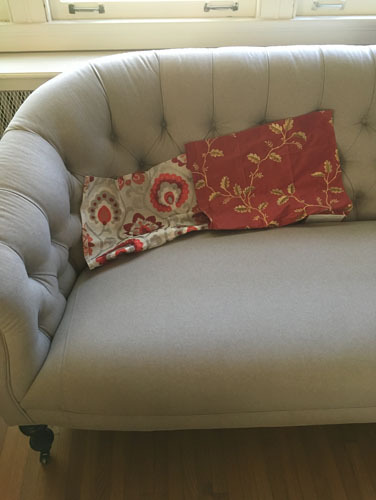 Ironically -- because I have worked in fashion and because I sew and do a lot of things with the associated fiber arts -- I have been most nervous about the soft furnishings part of this remodel. So I kind of put it off for a really long time and now it is getting to be time to think about it. It's not that difficult. None of it is that difficult. You don't need to be able to do differential equations to pick fabrics that look good together. You just need a full complement of cone cells, a couple of pictures of rooms that you like the look of, and a lot of restraint. For us, the decision about what kind of window coverings to use was pretty straightforward. I knew I wanted big dramatic draperies in the parlours (but no puddling, because that would be a furry mess), and mostly just roman shades in the other rooms. I knew I would use roman shades for light control even where I had draperies. I looked at endless images of rooms with draperies to see what I wanted (I saved some of the ones I liked best to my Window Coverings Pinterest board for those of you who like Pinterest; keep in mind that the only thing I was tracking in those images was the window covering). 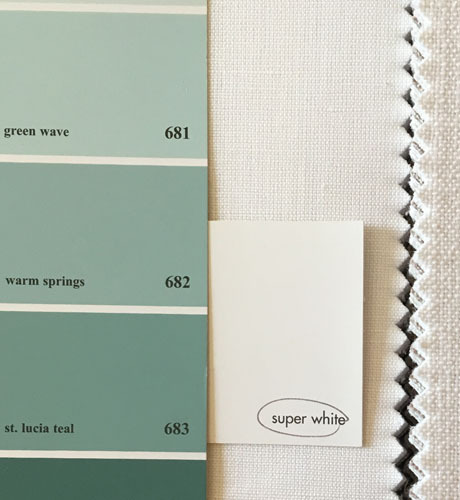 I knew I didn't want beige or tons of plain white, but I also needed to show some restraint. You can't have a room full of star performers; one thing has to take center stage. So let's start in the kitchen. Here's my palette in the kitchen. The very dark blue is the colour of the cabinets against the wall (the island is quartersawn oak). The wall is the light greige (that's a warmed-up gray for those of you who are not deep in the land of interiors-speak), and the trim is Benjamin Moore Super White. So I chose this fabric for the roman shades to stay warm and textural without getting too busy. There is a lot going on in this kitchen with a massive stove and hood, and the window coverings do not need to compete. In the dining room there won't be any roman shades, just be one giant light-blocking velvet drapery across the glass wall, but I haven't settled on that yet. I still need to decide what colour we are painting the dining room, and that will drive the drapery colour. In the parlours I went somewhat more formal. Again the trim is Super White (I'm just going with that throughout the house for continuity and also because I'm kind of done making decisions). For the era of Victorian house we have, the trim was always painted, so we're staying true to period. The walls in the parlours will be a warmer version of the aqua we have in there now, either the Warm Springs or Green Wave. I want the drapery to match the walls pretty closely, and I'm still looking for appropriate drapery fabric (I'm getting fistfuls of swatches of dupioni silk in the mail this week trying to find a decent match) but the roman shades will be the white in the background: a more formal tighter weave in a linen/cotton blend. 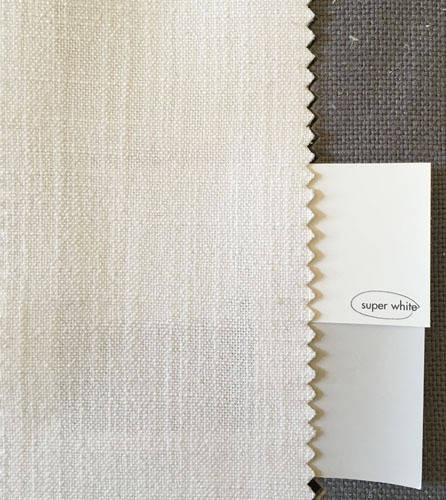 For the most part, the rest of the house will have a less formal fabric choice (also less expensive, which is not nothing when you are talking about a couple dozen windows). 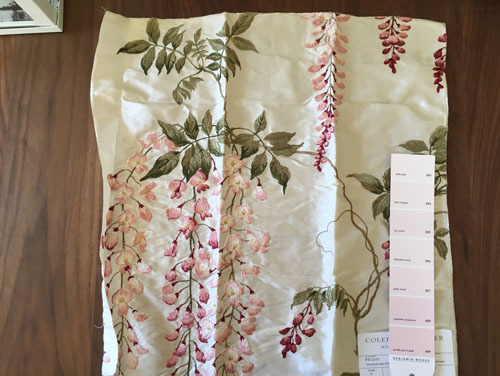 This is the roman shade material for the bedrooms, the front bathroom, and the back stairway. I'm showing it with the default colour scheme for rooms where we haven't made up our mind what colour we want to paint them (though I'm thinking we should do each bedroom in a different colour and refer to them that way like this is a Victorian novel). In our bedroom we are down to just one window, so it can be more extravagant. 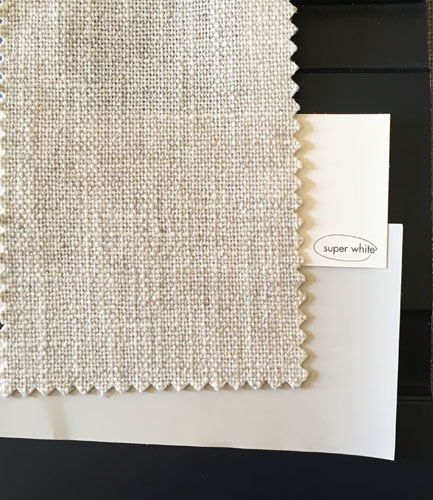 Our windows are six feet tall and three feet wide, and end up eating up around 15 yards of fabric each for draperies, so even a very budget $20/yard fabric adds up fast with additional cost for stabilizers, lining, and so forth. Get out of the budget realm with fabric and you are talking some serious expense. And then I saw this fabric. The paint strip has the pinks I chose for ceiling colours. I heard this tip once to paint ceilings pink to cast a flattering glow on the people in room below, and it works! Especially in green or blue rooms, where the reflected light always makes people look sick. It's surprising how much that little trick counteracts the wall colour. Anyway, I picked up this fabric at the Design Center yesterday even though I was in theory looking for aqua silks and not elaborate pink florals, and I love it. I couldn't quite decide how I would use it, though, since it was a little too big a pattern (that's embroidered on there, not printed) for a cushion. It really wants to be draperies. And we do have this bedroom with only one window. And then it just happened to perfectly match my pinks. So it looks like we will have a pink bedroom. Fortunately Noel is very confident in his gender and sexuality because I could see a lot of complaining from a different kind of man. 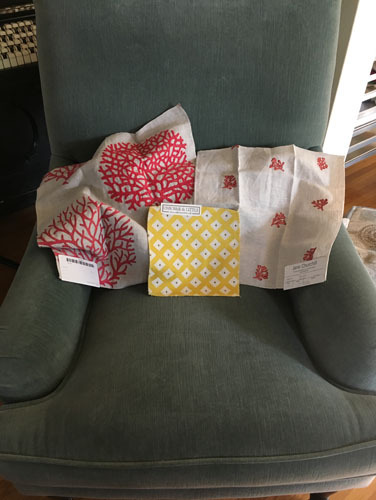 Other fabrics I picked up yesterday included a whole lot of drapery fabrics that turned out to be disappointing in context, so I will spare you the parade, plus some ideas for fabrics for sofa cushions. I like these two with our new sofa. I wanted pops of red in the room because I really like red. And here are some ideas I had for the chair cushions. The chairs came with matching cushions but that is so boring that I've been planning to replace them with some colourful ones. I like the red but adding some yellow might be interesting, too. A few things: until somewhat into the 20th century, pink was a masculine colour. A diluted red, maybe,but I have a pic of my uncle Leo in a long pink dress. In the early part of that century, pink and blue switched gender identities; blue used to be the girl colour (Mary's robe, etc.). So go for the pink bedroom, it'll be warm and soothing. Also, try Silk Baron in California for good prices and a wide selection. Best wishes, and a happy new year. Oh, yes, I'm aware of the history of pink as a gendered colour. But there are plenty of modern men who freak out at the idea of pink things in close contact with them. I think pink rooms are stunning and do make people look happy. The house my wife and I bought 10 years ago had pink/rose and cream Toile wallpaper in the foyer, up the stairs and in the hallway. We had matching pink in the living room. The main reason for the change was the wallpaper was 15 years old and showing wear. We went with different colors but do at times miss the pink. I think most men like pink more than they care to admit.